FlyDubai Boeing 737 passenger plane has crashed while landing in the Southern Russian city of Rostov-on-Don on earlier Saturday (19th March). The Russian Plane crashed carrying 62 people from Dubai and all were dead according to the Officials latest report, still investigation process is going on. Scroll down to see CCTV footage recorded during the plane crash. Russian Plane Crash – What happened to Boeing 737? The crashed plane was believed to be Boeing 737 which is the property of FlyDubai, a budget airline which is started during 2009. This is the first time a FlyDubai plane involved in a crash, really a bad day it seems. Russian investigation team confirmed that all 62 people on board were killed in this accident. Earlier, the airplane tried landing first time and due to some fog and unclear cloud issues pilot left his first try. After some minutes, the team tried to land the plane and it went 100 meters away from the runway. Suddenly it hits the ground and plane blasted into pieces. Poor visibility caused by heavy rain earlier could be the main reason for this Russian plane accident. A Blast occurred shortly after the plane crashed according to the Officials. After the accident, the airport was shut down immediately and investigation team confirmed about all people on board dead in the accident. They are investigating further details regarding the incident. The official website of the FlyDubai was temporarily blocked their regular booking page. There is no exact reason regarding what happened to the plane. But according to the local media, weather is the major factor of the incident. 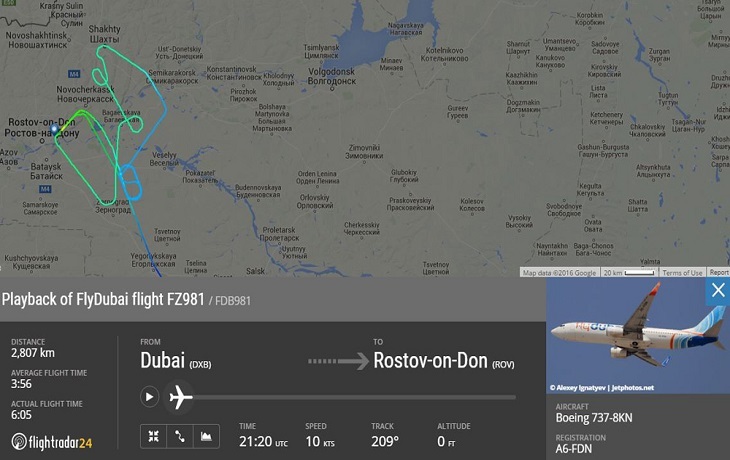 According to the tracking result of Flight Radar 24, Boeing 737 made a number of turns before landing in Rostov-on-Don. This Russian plane crash a terrible accident after Malaysian airways crash last year. These days, aircraft companies should think about more security than profitability. Stay tuned for more updates! Sharing is Caring.